"The Big Apple", "Gotham", "The Center of the Universe","Liberty City", "The City That Never Sleeps", "The Capital of the World", "Metropolis". New York (also called New York City, short form NYC) is the biggest city in the United States, located in the state of New York. Over 8 million people live in it, and over 22 million people live in the bigger New York metropolitan area. It is in the south end of the state of New York, which is in the northeastern United States. It is the financial capital of the US since it is home to the nation's stock market, Wall Street, and the One World Trade Center. It is also the home of the United Nations Headquarters. The oldest part of the city, the island of Manhattan, still has its original Le-nape Native American name. Although Native people such as the Le-nape and Canaries had lived there for many thousands of years, New York City was first explored by Europeans in the 1500s. Florentine explorer Giovanni da Verrazzano found the entrance to New York Harbor in the year 1524 and English explorer Henry Hudson named the Hudson River in 1609. New York City was settled by Europeans from The Netherlands in 1624. The Dutch called the whole area of New York "New Nederland" (New Netherland) and they named a fort and town on the south end of Manhattan Island New Amsterdam (New Amsterdam), after the capital city of the Netherlands, which was to become present-day New York. The English took over the colony in 1664 during the second Anglo-Dutch War. They changed the name to New York, to honor the Duke of York, who later became King James II of England and James VII of Scotland. The Dutch surrendered Nieuw Amsterdam without fighting. By the time the English took New York, there were many other Dutch towns in what would become New York City, including Breukelen (Brooklyn), Vlissingen (Flushing), and Nieuw Haarlem (Harlem). There were already some English towns in the area also, such as Gravesend in Brooklyn and Newtown in Queens. Dutch, English and other people had been living together in New York for a long time. New York quickly grew to become a large and important port city. The important Battle of Long Island of the American Revolution was fought in Brooklyn in 1776. New York was the capital of the United States under the Articles of Confederation from 1785 to 1788. When the US Constitution was made, it stayed as the capital from 1789 until 1790. In 1898, the cities of New York and Brooklyn came together with the Bronx, Staten Island, and the western towns in Queens County to make Greater New York. This is the total area of the City of New York today. Around this time, many new immigrants came into New York City. They came in at Ellis Island, an island in New York's harbor near the Statue of Liberty. Many of them then moved to the Lower East Side neighborhood in Manhattan, which had over a million people living in just a few square miles. Early in the twentieth century, with better transportation, more people moved to outer parts of the greater city, and many commuted to Manhattan. Many skyscrapers and other big buildings were put up to provide places to work. Most of New York City is on three islands near the Atlantic Ocean, although one part is on the mainland of North America. The city includes all of Manhattan Island and Staten Island, and the western end of Long Island. There are also many smaller islands. Water divides several parts of the city. Part of the Hudson River forms the border between Manhattan and the Bronx on one side, and the State of New Jersey on the other side. The East River forms the border between Manhattan on one side, and Brooklyn and Queens on the other side. The Harlem River forms the border between Manhattan and the Bronx (except for a small part of Manhattan that is on the mainland). Part of Long Island Sound separates the Bronx and Queens. Newtown Creek is part of the border between Brooklyn and Queens. Some parts of the city are very separate from the others because of water, such as Rockaway in Queens and City Island in the Bronx. 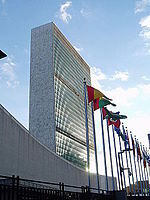 A small piece of land in Manhattan is international territory and belongs to the United Nations Headquarters. The hallmark of New York city is its many skyscrapers, especially in Manhattan. In New York City there are about 5600 skyscrapers. 48 of them are over 200 metres tall, which is the highest number of skyscrapers in one area in the world. New York's climate is between humid subtropical and humid continental. The hottest temperature ever in New York City is 41 °C (106 °F) and the coldest temperature ever is -23 °C (-11.1-13 °F). In 2012, Hurricane Sandy hit New York City, causing part of Manhattan to lose power. New York City gets some snow in winter. New York City currently has over 9 million people. Over 20 million people live in the New York metropolitan area including the city. The majority of the people in New York City belong to ethnic groups that are minorities in the US. New York City has had large numbers of immigrants for centuries. In the early 19th Century, they came from Ireland and Germany. Later in the 19th century, they came from Italy, Russia and Eastern Europe. Today, many are from Puerto Rico, Haiti, the Dominican Republic and Colombia. The mayor of New York is Bill de Blasio, a Democrat. The city also has a City Council that makes some local laws. Most laws in New York City are set by the state government in Albany. Subway transportation is provided by the New York City Subway system, one of the biggest in the world. Pennsylvania Station, the busiest train station in the United States, is here. John F. Kennedy International Airport, which is in the Queens borough of New York, is one of the busiest airports in the United States. 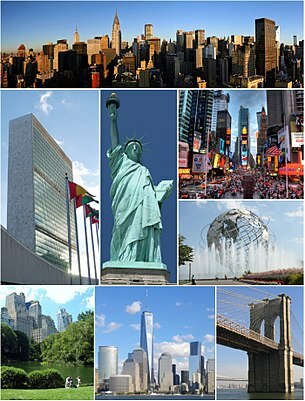 ↑ "Why is New York City known as 'the Big Apple' and "Gotham?"". Dictionary.com, LLC. Retrieved May 28, 2013. ↑ "General Article: New York After WWII". Corporation for Public Broadcasting. Retrieved May 28, 2013. ↑ Eugene J. Sherman. "FORWARD New York – Capital of the Modern World". The Weissman Center for International Business Baruch College/CUNY 2011. Retrieved May 28, 2013. ↑ 6.0 6.1 "US Gazetteer files: 2010, 2000, and 1990". United States Census Bureau. February 12, 2011. Retrieved April 23, 2011. ↑ "Annual Estimates of the Resident Population: April 1, 2010 to July 1, 2017 – Combined Statistical Area; and for Puerto Rico – 2017 Population Estimates". U.S. Census Bureau. Retrieved April 27, 2018. ↑ Community Facts for New York city, New York, United States Census Bureau. Retrieved May 26, 2017. ↑ Rubin, Susan Goldman (2004). L'Chaim! : To Jewish Life in America!. Harry N. Adams in association with The Jewish Museum. ISBN 978-0-8109-5035-1. ↑ The Nine Capitals of the United States. United States Senate Historical Office. Retrieved June 9, 2005. Based on Fortenbaugh, Robert, The Nine Capitals of the United States, York, PA: Maple Press, 1948. ↑ "NowData - NOAA Online Weather Data". National Oceanic and Atmospheric Administration. Retrieved 2018-04-10. ↑ "Station Name: NY NEW YORK CNTRL PK TWR". National Oceanic and Atmospheric Administration. Retrieved 2018-04-10. ↑ Empire State Development. "About Moynihan Station.". Retrieved 2011-03-07. This page was last changed on 17 March 2019, at 14:55.